What are the benefits of NCTE membership? NCTE’s course is set by our member leaders, who are elected to serve in these important positions each year. What do our elected leaders do? This is why voting for new leaders for the Council is one of the most important things you can do as a member. And this year we’re trying some new things to make the voting process stronger. Depending on which groups within the Council you belong to, election season historically meant getting flooded with many emails—each tied to a different ballot. You might think you were done voting and all of a sudden, a request to vote on a completely different ballot would show up in your inbox. It was confusing and hard to keep track of. This year you’ll get all your ballots listed in ONE email that has a link to ONE member-unique webpage that houses each ballot you need to complete. When you finish voting on a ballot, it will register with a green checkmark on your webpage so you never have to guess if you voted or not. 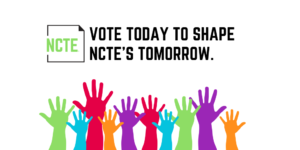 In order to promote an ethical election process and level playing field for all candidates and to encourage members to read the ballot materials and make an educated vote, NCTE provides a central source of information about candidates for NCTE office. While it’s natural for individuals and groups to discuss the merits of candidates, NCTE, in the name of fairness, prohibits any activity that can be construed as campaigning by or on behalf of an individual candidate. Campaigning is considered to be any activity intended to influence the election. Because of this policy, the course of our elections is determined entirely by each voter’s own inquiry into who they believe will do the best job of filling each of our many elected roles. We encourage you to think about what you value most about NCTE membership and what you wish you could see us doing in the future. Then look through this amazing host of candidates and consider who you believe can make that vision a reality. Your vote and those of your member colleagues determines who is at the helm.